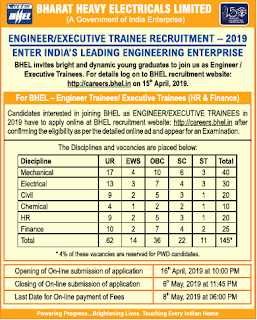 Bharat Heavy Electricals Limited (BHEL) invites applications from bright and dynamic young graduates for recruitment of Engineer Trainees and Executive Trainee in HR and Finance disciplines. The online registration of application will be open from 16th April 2019 and scheduled to be close on 6th May 2019. Upper Age Limit: Maximum 29 years as on 1st April 2019. The upper age limit is relaxable for candidates belonging to SC / ST (by 05 years) and OBC (NCL) (by 03 years). Executive Trainee (Engineering Disciplines) –> Full Time Engineering Graduate (B.E. / B.Tech) OR 05 year Integrate master's Degree or Dual Degree programme in Mechanical / Electrical / Civil / Chemical discipline. Executive Trainee (HR) –> (1) Full time Regular Bachelor's Degree with atleast 50% marks in aggregate in all year. (2) 02 years full time regular Post Graduate Degree or Diploma in Human Resource Management/ Personnel Management and Industrial Relations/ Social Work/ Business Administration with specialization in Personnel Management or Labour Welfare or HRM with minimum 50% marks in aggregate in all years / semesters. Executive Trainee (Finance) –> Full time Regular Bachelor's Degree with Qualified Chartered or Cost and Works Accountants. Application Fee: Application Fees ₹ 500/- with Processing Fees ₹ 300/- + GST for General / EWS and OBC category candidates. Only processing fee ₹ 300/- for Reserved (SC / ST), PWD and EXSM candidates. Selection Process: Computer Based Examination and Interview. 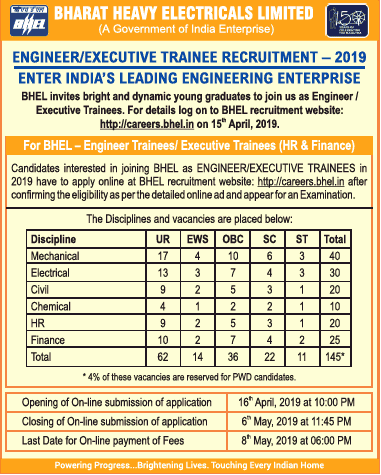 How to Apply: Eligible Interested candidates apply online through BHEL Careers portal. The closing date for submission of online registration is 06/05/2019 up to 11:45 PM.